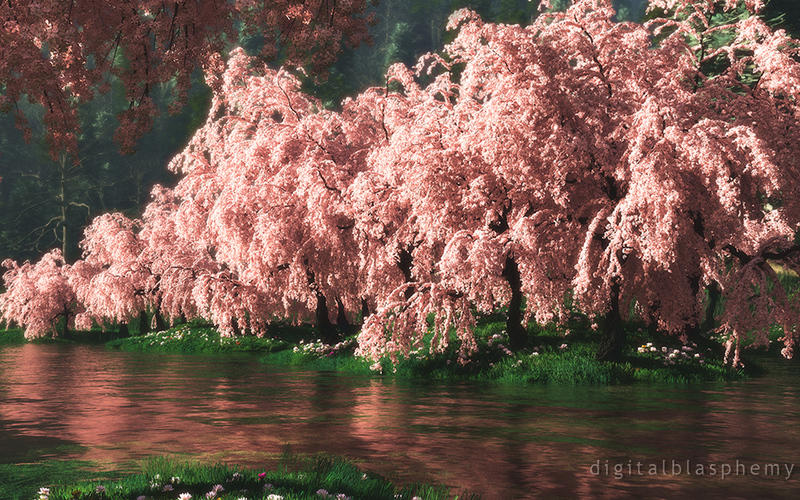 Vue 11's new "360 Ecosystems" finally allows me to create a proper flowering tree using 3D blooms. I've used this tech so far to create Christmas lights and a few glowing blooms but this is my first attempt at Chery trees. This render itself is actually a "first draft" and there are a few aspects that I would still like to tweak, but I thought it came out nice enough to share while I render my revisions. I like this better than the pink version. The blue works very well against the water and I feel that there is more definition using this colour. I particulary enjoy your treatment of the reflection. It makes me think of a type of tea I drink, Sakura Sencha (green with cheer blossoms) It makes me think of spring. Ever since the new Sakura came out I was mesmerized with it and loved it. This blue one has made it even better and it now is proudly displayed on my desktop! I like the original better. It is soothing, quiet, peaceful and contemplative. I know much more work went into the 2013 version, but the treatment of the 2006 version has more to do with a peaceful scene and quietly soothing my mind than this one. Some images just strike me as being 'right', Sakura 2006 is one of those. It's very soothing. A perfect centering point for a chaotic mind like mine. This is another one that really strikes me. I usually like a variety of colors, but this one really does make me think of spring and being out in the shade with my family. Can we have this in dual and tri-screen? It really is my favorite but it's a dual screen repetition. That's a ten!! Holy Shoot! Now I know why my favorite color is blue! What a gorgeous picture it is that sits on my 27" monitor. Thank you, again, so much, for your God-given talent, and for doing something about showing it to the world. My lifetime subscription was a smart investment! OMG I want more pictures like this! Love it! Spectacular. Just makes me want to go there and never come back. Best of the three. This type of work is why I'm a lifer. Good stuff, Ryan. Still my favorite of the 3 versions (Day/Night Pink and Blue). Definitely worthy of being promoted out of the picklejar to it's own page. Any chance to get zips of the picklejar versions? Your best work is like this, when you take us to places we feel that we almost know and long to visit. This looks just like the Jacaranda trees that grow where I live (Sydney, Australia). In fact I have two large trees that look just like this image every November! Fantastic! Love it one, then again blue is my favorite color. Would love to see the multiscreen renders. is there a link to see all of the picklejars? i usually have to go from picture to picture too see if there are any variations, is there a link to just go to the gallery of all the variations? "Not to take up more of your time..."
Can't wait for the night version, but curious if a mix of the blue and pink blossoms might be pickle jar worthy? Any chance there will be dual and triple screen renders of the blue version? Very nice PJ version! I'm looking forward to the night version, too. Thanks, Ryan! Of course, I'm partial to the blue and purple tones. My blue version in the Pickle Jar is for you! "Galaxy S4 and HTC One Resolutions "
Many new phones are offering screen resolutions of 1080x1920. It would be awesome if you could include these resolutions so we can have your amazing wallpapers on our HD phones!! I love cherry blossoms, even though we don't have 'em here, and well, spring's muttering about still being the season of choice (autumn? what autumn?). Case in point, we had one of our classic early-summer thunderstorms two days ago. This...is a nice change in pace. The way life should be... It takes me back to simpler better times. Makes me want to spread out a picnic on those banks... If that's not a 10, I don't know what is. Ryan, this one is simply stunning! Kudos! What a wonderful delivery time for some peace and beauty in our lives. This immediately made my heart melt, in a great way. And yes, this will be on all of my monitors at work, for the chicks. ;) Thanks in advance for the convos to be had.. Absolutely perfect! I love this one, Ryan! Ryan, I think you outdid your self this time. The pink flowers over the swollen river is awesome. This one definitely rates a 10 on my Ryan-o-meter. And this is what I meant by your next masterpiece.. well done! The only minor complaint (hence the 0.5 deduction) would be the grass going all the way to the shoreline. I actually had to rate this a 9/10 since there is no 0.5 increment. Oh, this is an improvement! I loved the original back in the day, but you could see how flat it could be when you looked at it up close. This is lovely. Nicely done. I've decided this one is pretty good as is so I don't think I will be making any changes. There certainly some things I could tweak (the shoreline, the background, the water) but I don't think any of those things would significantly improve the piece. Besides, once people have seen a piece and I change more than one thing I invariably get complaints that some changes helped and others were negative. So, I think I will move on to a new project now (unless I hear mass objections). I already have something in mind in fact. As Monty Python would say: "And now for something completely different...". Fantastic. I really like the old Sakura. This update has a completely different, eh... "feel" for me, but that's OK, it's awesome nevertheless. I'm curious about the changes you wrote you would still like to do. When this is only a draft, how great will the final version be...? That will always be a problem when I change more than one aspect of a render. In this case I felt the multi-colored flowers (especially the yellow ones) really clashed and detracted from the scene. Sorry! Well I didn'tthink there could be a way to improve this but I must say I really like the trees better in the updated version. However, now I think the flowers along the riverbank were better in the first version :( The colors were more complimentary for the scene. 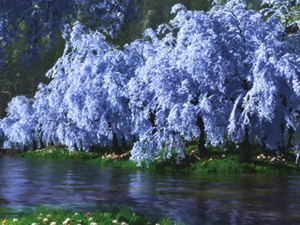 Could you possibly insert the new style trees with the first scene that had the better flowers at the riverbank? Opps I mean left left! I love it almost perfect running on a 5760x1080 res I can’t help thinking the trees on the bottom right the ones on the river bank look slightly out of focus in comparison to the other stuff (not sure if this is intentional) but lovely never the less my new wallpaper! I know there not around in autumn and don’t turn gold or anything but different coloured blossoms would be amazing! Was not expecting this at all. Gorgeous! 10/10. I loved the original Sakura, it was one of the first pieces I saw from your collection and was one of the reasons I joined your site. I'm glad to see it get an updated render. The pictures is more advanced than the old one, gorgeous trees. I liked the distance look of the old picture, however. So beautiful! Quite a change from the barren desert of Arrakeen; it's perfect for my spring wallpaper. Thanks, Ryan! The stream reminds me of spring, when the freshly melted snow overfills the banks. I used to have neighbors that would have a pond each spring until all the ice downstream melted, then one day the water would just go away. I really like the submerged grass in the left corner. Kind of wish it was more evident throughout the rest of the image that the ground is pretty well flooded, still nice though. It's gorgeous, it's a beautiful springtime, and I love cherry blossoms. It does make me think of Japan. "Not as strong as 2006"
While this piece is beautiful, I find myself less drawn to it than the 2006 version. On close inspection I think what I liked better about the old was the reflection of the treeline against the sky in the water giving a color gradient effect. Here below the blossoms everything is rather dark and muddled. It's stunning. And Ryan, I must admit it's very true what you say about the ladies being attracted to the workstation. Ever since I use your backgrounds on my desktop at work, I've had several female colleagues asking me where I took that amazing photograph...some of them rather disappointed when I tell them it isn't a photo but a piece of art, others even more enthusiastic when I point them to your website. And I certainly don't mind the attention! Reminds me of the dogwoods we have blooming around town, although the blossoms aren't as dense. Thank you! I consider that to be part of my job. Absolutely amazing. The world needs a reminder of some of the beautiful things in life this week, and this certainly delivers. I thought they clashed myself. Sorry! @Adamtrons: I've noticed the ladies seem to like this one and I am thrilled with that. You might find one or two attracted to your workstation if you had the right desktop and that certainly isn't against the code (is it?). I like the new trees and grass but prefer the ground cover flowers from the first version. I thought the additional color was nice, though I also see how someone could say it clashed with the trees. Looks great either way. This is beautiful and I would not change a thing as far as the content but my code of masculinity prevents me from setting a pink tree as my desktop. Ha. Would be great to see a purple pickle jar variation of this although I don’t know if purple cherry blossom exits in reality. Geeze, I want this in my backyard. Any expert landscapers? not to argue....but in the MidWest Spring when the water is high--the grass IS at the waterline!!!! takes it awhile to go down!!! Thanks for the feedback! As I mentioned further down in the comments, I was going for the "swollen stream" look here as a little homage to all the rain we've been getting. I definitely know what you mean about stream banks though. I love the composition, the colors, and the subject matter. One thing that I have noticed on this and a few other of your images, "Grass does not grow all the way down to the waterline". There should be a little bit of bank or rock barrier showing at the interface between water and land. This is a gorgeous piece, and other than that one caveat, it is definitely one of the best you have produced! Oh gosh, this makes me so happy. I have been hoping you would create an updated Sakura for quite a while now. I love it!!! Thank you. I have been to Japan and have seen the beautiful Sakura trees in all their glory, and this is exactly what I hoped for. Fantastic reminder of spring after the last 24 hours of snow! I love this one! The color scheme and lighting almost makes it look like its not quite real; almost like its made out of candy or clay or something. Nonetheless its a great work and I'm glad to see that you're not making any more dark colored "minimalist" ones for now. Wow. Love it - definitely gets me pumped for spring. I will agree with JMK that the grass looks a little "more real than real," but it's still a great work. Love it! This is a really, really nice render - very peaceful. I would love to see some fallen blossoms floating along the river (a-la Haiku). I love this one. I'm not usually a fan of anything pink, but the Sakura tree is one of my favorites and it has definitely been done justice here. I can't wait for the later revisions! Thanks! The branches in the upper left are about as close as I would want to get. This is one of the few pieces that look very Pixar-esqe. I feel like Shrek and Fiona could have a nice picnic under that tree. I love sakura, and this is class DB! So realistic but also too perfect for words! 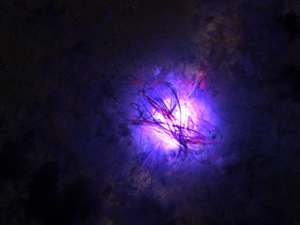 I prefer abstracts and space scenes, but this is awesome! That's a good idea. I wanted the water to look like a swollen stream however as a nod to the rainy weather we've been having lately. Amazing. Love the trees! Not so hot on the grass. I know you can do better. How about a couple of rocks in the river for interest? I liked the foreground tree in the original Sakura that was used as a framing device in the single monitor view. I think i see a little bit of that in the corner of the updated version. Perhaps we'll see more in the multi-screen render?